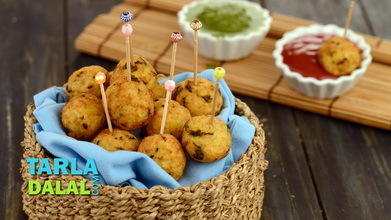 Mildly-flavoured dough of besan and fenugreek leaves, is stuffed with a rich filling of paneer and raisins, and deep-fried till golden brown. The soft interior and crunchy covering of the stuffed methi paneer pakoda is indeed an enticing balance that pulls you to pick more from the platter! 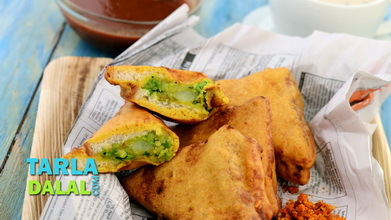 relish these pakode with a hot cuppa of tea! Heat the oil in a deep kadhai, add the fenugreek leaves and sauté on a medium flame for 30 seconds. 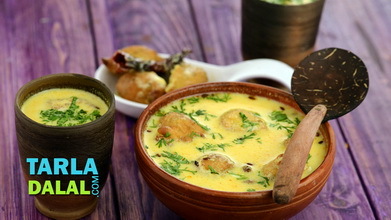 Add the salt, turmeric powder, green chillies, besan and 1 cup of water, mix well and cook on a slow flame for 3 to 4 minutes, while stirring continuously. Divide the covering into 8 equal portions and roll each portion into a round ball in between your palms. Press a little in the centre of each round to make a depression. Place 1 portion of the stuffing in the centre of each round and roll again to form a ball. Heat the oil in a non-stick pan and deep-fry a few pakodas at a time till they turn golden brown in colour from all the sides. Drain on absorbent paper and serve immediately with sweet chutney.